The following is a guest post about starting your own business. If interested in submitting a guest post, please read my guest post policy and then contact me. An average of 514,000 new businesses opened in the United States in every month of 2012. Some will thrive, but studies show half of them won’t last a year. A staggering 95 percent of them are destined to fail within five years. With the odds stacked against your venture, it’s vital that you do your research and consider the following five areas before you open for business. Here is a guide that can help you in making sure that you don’t forget anything during your planning period. You may have come up with a snappy name for your business, but it’s not time to order your office stationery just yet. Unless the trademark is available, you’ll need to go back to the drawing board. The United States Patent and Trademark Office website offers an easy online search which shows whether your dream business name is up for grabs. In the digital age, it’s important to cross-reference your preferred business name with available domain names. With more than 98 million dot-com domain names registered, it’s tough to find one that’s suitable. However, if you own just one Internet address, it should be a dot-com. It’s the domain most people are familiar with, so it’ll take some training for them to type anything else into their browser. Some smartphones also have dot-com buttons, so they’re most commonly used by mobile browsers. Compare available domains and trademarks to come up with your ideal business brand. Running a business is about much than taking care of the dollars and cents. It’s crucial to understand the, government laws, regulations, taxes, and licenses required in the set-up and running of your new endeavor. Online research goes a long way, but it’s a good idea to speak to an accountant and a business lawyer to make sure you’re playing by the rules. Failing to charge the right taxes or get a necessary license could be a costly mistake. The right computer software and smart phone apps can make day-to-day business operations run smoother. Research which programs others in your field recommend, and read plenty of user reviews to decide whether they’re right for you. These impartial evaluations are much more reliable than the copy created by firms intending to sell their products. It also typically takes time to use these programs to their full potential. Tinkering with a program before your business is operational helps you avoid a steep learning curve on the job. Consider taking a training course if your computer skills are lacking or if the programs you’re using are particularly complex. You may have expert knowledge about landscaping, but that doesn’t mean you can design an effective website, keep the books straight, and create a business plan. Hiring part-time staff or freelance contractors is a good alternative to finding full-time staff in those early days when money is tight. Have a clear idea of the skills you need and keep them in mind when you’re interviewing candidates. This will make sure you make objective decisions rather than being swayed by likable personalities. Starting a business, be it a large or small business, takes a significant amount of time and money. While every business is different, a 2009 study from the Ewing Marion Kauffman Foundation put the average amount of start-up capital required at $30,000. Small firms including home-based businesses and online ventures often cost much less, but large enterprises are much more expensive. Grants and donations from angel investors can offset these costs, but it’s important to consider what you’ll need to pay and what you can reasonably afford. Also, factoring accounts receivables is a way to get instant funding from work that was already completed, but this source of funding comes with a fee. Remember to consider not just business expenses, but your own cost of living and personal financial obligations. When you start your own company, you can count on working 60- to 80-hour weeks for at least the next two years. Vacation time may also be put on the back-burner for the foreseeable future. Can you afford that time? Do you even want to? Have lengthy talks with your loved ones to decide whether it’s the right time to sacrifice your personal life to fulfill your business dreams. The statistics can make opening a business seem daunting, but with the right preparation you can beat the odds. With 95% of new businesses failing within the first five year, I’d imagine that there is 500 things you research and consider before starting a new business! That is a truly incredible figure! I would also add the importance of making sure the business works FIRST. By this I mean that you shouldn’t be thinking about raising capital or expanding until you have a service or product which you are sure will sell (and you have the contracts and sales figures to prove it). I would add scouting the market and securing a good business location there. Nevertheless, as moneystepper said, there are really hundreds of things you should research first before starting a business and those are just some of it. There are hundreds of things to consider before you start a business. However, if most people were aware of them, they might not start a business. So it’s crucial to focus on the fundamentals. If you can answer these 3 questions, you’re well on your way to a viable business. Managing the financial aspects of a business is critical. This means keeping that overhead extremely low until you know profits can support more. Don’t borrow a bunch of money to start a business, especially from your own house. Print your own letterhead in the beginning…don’t fall for “saving money” by ordering mass quantities. Your logo might change. Your contact info might change. Have separate accounts for your business. This means separate banking and separate debit/credit cards. Don’t co-mingle funds. It will make your life a lot easier come tax time. Also, SBA.gov has a great tool for building a business plan. 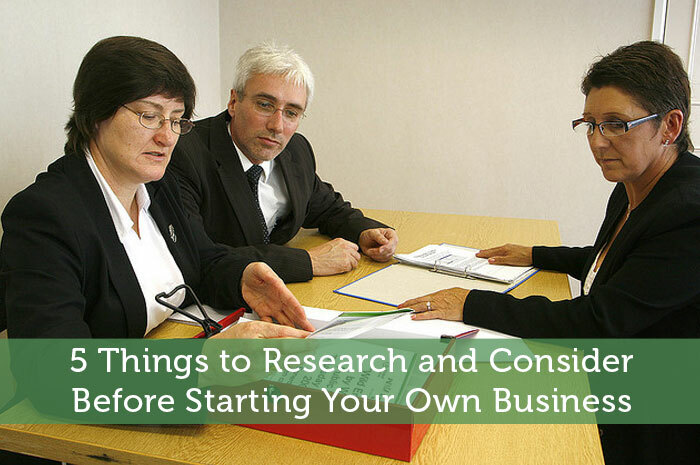 Starting your own business has a lot of considerations. I wish I had done more considering before I started. Luckily things worked out for me, but mostly because I kept those expenses at a bare minimum!! Write a Business Plan! Creating a business plan will force you to consider ALL of these things. Definitely agree that writing up a business plan, even if it is just notes in a notebook, will force you to review all of the 5 points. Another critical element, which the business plan would also address, is determining the market for your business product or service. If you don’t have a good idea who is willing and able to buy your product, you likely won’t sell much. As I work with clients who are starting up a business, when we crunch the numbers it often reveals a very different projection from what the client expected. It’s much easier to make changes in pricing, products offered, processes, number of start up employees, etc., if you do it on paper before you’ve invested money and started off in the wrong direction. I’d expect that a well-researched business plan alone would reduce the failure rate dramatically. I’m shocked (and a little horrified) that some people don’t even have a business plan for their companies when they start them. It’s an essential. It should cover lots of what you’ve mentioned. It needs to be complete with budgets, forecasted accounting, etc. I made a post that is relevant here that will help readers decide which type of company structure is best for them. It’s pretty confusing if you haven’t dealt with it before. In most cases, for a small business LLC is the easiest way to get up and running. Let me know if you have any questions I can help you with!